The 2018 MPA Annual Readership Survey has seen some shifts, with two publications now sitting firmly in front of the rest. 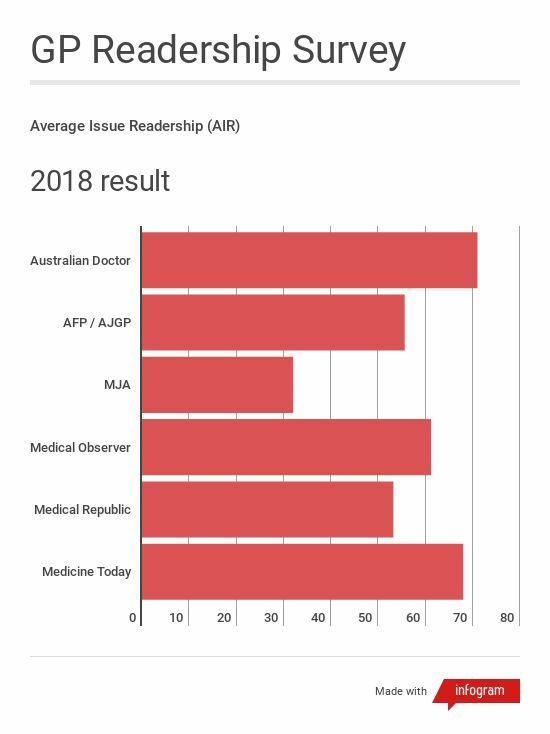 With readership unchanged from last year at 68%, Medicine Today is now the number one clinical journal with a 12.4 percentage point lead on AJGP and additionally has achieved the coveted number two position overall. The rebranding of AFP to become AJGP at the start of the calendar year saw the title’s AIR score come in at 55.6%, down from 71% in 2017. Australian Doctor is just holding on to their number one spot with a score of 71%, dropping from the 71.7% achieved last year. The stable Medicine Today print result echoes what many expert media consultants globally have been saying for some time — that print is by no means dead and niche-market publications with quality content will continue to occupy an important place in the minds of their audiences. The survey revealed that print is read by 93.9% of GPs nationwide. There was no significant change in digital reach with 62% of GPs accessing at least one of the titles’ six websites and 55% of GPs reading at least one of the e-newsletters in the past 24 hours to within the last month. The disconnect between the increase in pharma-industry enthusiasm for digital channels, versus the actual engagement of GPs in these areas, could warrant closer examination of what marketers are actually getting for their spend in different channels. Despite this, Medicine Today continues to find new and innovative ways to enhance the trusted and well-loved print medium with digital extensions such as video reporting on major conferences and events to help build the multi channel approach for industry. Talk to us today about how we can help you communicate to GPs in Australia’s number one clinical journal, Medicine Today.